What is Zerona? How does it sculpt the fat reserves away? Essentially what happens, as we age and perhaps gain weight our fat cells begin to expand nearly a 1000% in volume. There is debate as to if additional fat cells get produced as we age but there is no dispute that the fat cell grows as we expend less energy that we take in. Think of the fat cell like a water balloon, when we are young and we have a high metabolism our fat cell is small and deflated, but the fat cell like a water balloon expands when water is added. In the case of the fat cell, it accumulates lipids. Zerona has been clinically proven to deflate the enlarged fat cells restoring them to the original lean state. Think of Zerona has the small needle necessary to slowly break open the membrane of the water balloon, when that occurs the water begins to leak out. When Zerona opens up the outer membrane of the fat cell the lipids stored inside begin to leak out. Once released, the lipids can be used as a source of energy. This process is known as lipolysis if you want to learn more about it. 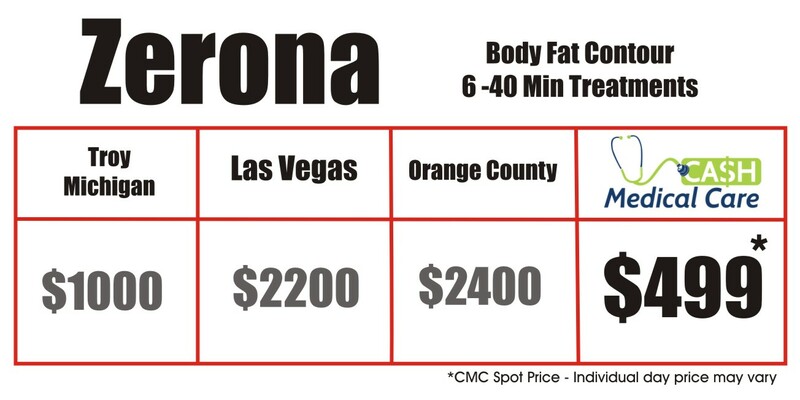 Zerona will concurrently treat the millions of fat cells located in your cosmetically troubling area. During a Zerona treatment you will not feel the Zerona working but you will see a 3.5 inch reduction across the waist, hips, and thighs in two weeks. Finally, Zerona was proven through the exact same quality of study a pharmaceutical drug company goes through to prove the effectiveness of a drug. Treatments are just two weeks and the result is visually apparent after just two weeks. So in short, Zerona safely takes enlarged voluminous fat cells and restores a healthy lean state in two weeks through the science of photochemistry. Zerona is an extremely safe procedure. It endured a Level (1) clinical trial to proves its efficacy and safety. During the trial there were no recorded side effects and in 30 years of Low Level Laser research there have been no side effects reported. Studies revealed an average of 3.65 loss in two weeks. Zerona is the only product on the market to prove is effectiveness through a multisite, placebo controlled, randomized study. -The standard treatment consists of six, 40 minute treatments (20 minutes for both front and back). -Patients losing on average 3.65 inches from their waist, hips and thighs. -We do recommend that a patient keep hydrated during the treatment, maintain moderate exercise and take the supplement niacin for optimum results. Also, we don’t recommend ZERONA for those with thyroid conditions or diabetes. No Comments to "Zerona Body Contour"